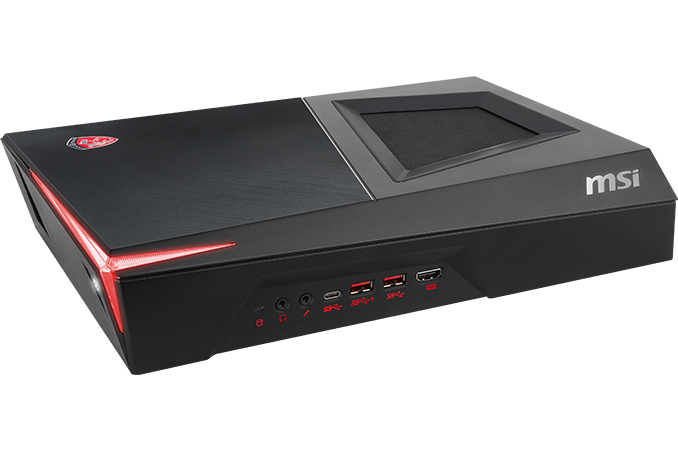 Over CES, MSI announced a new console-like PC called the Trident 3. The new unit packs the latest Intel’s Kaby Lake CPU, a NVIDIA GeForce GTX GPU, memory, an SSD and a hard drive. The system weighs just about three kilograms and its dimensions are smaller than dimensions of Microsoft’s Xbox One. Current-generation game consoles, while closed systems ripe for optimization, can have difficulty providing performance sufficient for Full-HD gaming. Many console gamers prefer to play their games on HDTVs rather than on monitors, and so makers of boutique PCs were set on introducing console-like computers featuring gaming-grade hardware. Manufacturers of computer components were, for various reasons, reluctant to launch their own SFF gaming PCs for the living room until last year. However in the recent months we have seen a number of computers from motherboards/GPU vendors cards that are both small and powerful. MSI began to sell its Trident system in November-December timeframe without making any loud announcements, and this month the company upgraded its mini PC with Intel’s Kaby Lake processors but retained the chassis and the platform. The MSI Trident 3 is based on a custom Intel H110 powered motherboard, along with a choice of Intel’s Core i7-7700 / i5-7400 processors and NVIDIA’s GeForce GTX 1060 / 1050 Ti graphics cards. By default the PC comes with 8 GB of single-channel DDR4-2400 memory (upgradeable to 32 GB), a 256 GB M.2 SATA SSD, one 1 TB hard drive and a 230 W external PSU. Despite the miniature size, the MSI Trident 3 is upgradeable: the CPU, the graphics adapter, the DRAM and storage devices may be changed. Due to lack of space inside, it is impossible to install a video card longer than 17 cm or additional drives, but such limitations are understandable. Moreover, keeping in mind that many SFF PCs use mobile components soldered to their motherboards, so using desktop-class components is a tradeoff between replaceability and size. When it comes to connectivity, the MSI Trident 3 has a lot to offer: three USB 3.0 Type-A ports (two front, one rear), one USB 3.0 Type-C header (front), four USB 2.0 connectors (rear), Gigabit Ethernet, an IEEE 802.11ac Wi-Fi with BT 4.2 module, six display outputs (four HDMI, one DisplayPort, one DVI) to easily connect VR headsets and up to three monitors, 5.1-channel audio with Audio Boost 3 and Nahimic software enhancements and so on. MSI’s Trident 3 can be installed both horizontally and vertically, depending on its owner’s tastes. Moreover, the system is equipped with RGB LEDs so to customize its look. The MSI Trident 3 featuring Intel’s Kaby Lake CPUs will be available shortly with the basic configuration (Core i5-7400, GeForce GTX 1050 Ti 4 GB, etc.) starting at $899, while the more advanced builds will naturally cost more. That's a crazy price though, especially for something with a GTX1050. PC gaming makes sense though, with sites like bundlestars and humble bundle, you can save $100s by buying PC vs console games, and get better graphics quality. You can also use it as a HTPC and do Netflix or KODI. There is a market, albeit niche, for being highly compact and portable, while still being a PC.